The neurosurgical team at Sita Bhateja Speciality Hospital is led by Dr Arvind Bhateja – a brilliant neurosurgeon, Medical Director of the institution and the son of Dr Sita Bhateja, founder of the institution. 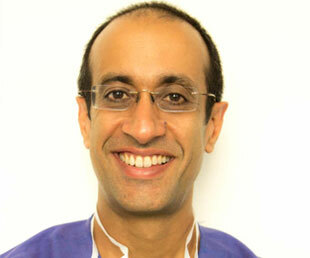 Dr Bhateja has an air of quiet assurance about him that is confidence-inspiring to both patient and colleague alike. No stranger to academic excellence, Dr Bhateja gained accolades throughout his student days with gold medals from M S Ramaiah Medical College, the Indian Society of Otolaryngologists (in ENT) and Bangalore University. During the course of his MS in General Surgery (at Seth GS Medical College and KEM Hospital in Mumbai) he performed and assisted in over one thousand five hundred general surgeries. This laid the foundation of his surgical prowess. He then went on to do his M Ch in Neurosurgery at NIMHANS. During this time he performed and assisted in hundreds of neurosurgical operations and was also involved in neuro critical care management and management of emergency services. Dr Bhateja is especially interested in minimally invasive neurosurgery and spine surgery, trans-sphenoidal endoscopic approaches, disc replacement, spinal fusions and skull-base approaches to neurosurgery. He specialises in the endoscopic endonasal approach to pituitary tumors, microvascular decompression, craniovertebral junction anomalies – C1-C2 lateral mass fusion, vestibular schawannomas / acoustic neuroma surgery, awake craniotomy, intra-operative neuro monitoring, intra-operative fluorescence guided tumor resection, spondylolisthesis and minimally invasive TLIF. In his continuing pursuit of excellence Dr Bhateja has attended (and continues to attend) specialised courses in his areas of expertise. Notable among them are courses in virtual reality in neurosurgery and spine surgery (National Neuroscience Institute, Singapore), minimally invasive surgery (University of Mainz, Germany), neurosurgery with a special emphasis on vestibular schwannomas (International Neuroscience Institute, Hannover, Germany) and keyhole and endonasal surgery for brain, pituitary and skull base tumours (Las Vegas, USA). To date, he has performed more than three thousand neurosurgical procedures. In recognition of his accomplishments and expertise, he was recognised as a ‘Leading Spine Surgeon’ at the India Spine Vision 2007 Conference (New Delhi, 2006) and has also been awarded the ‘Rashtriya Rattan Award’ by the Global Economic Council (Bangalore, April 2007).